Bob Dylan (a.k.a Robert Allen Zimmerman in certain walks of life) is considered to not only be one of the most important artists of the 1960s, (some say one of the best ever) but also one of the most influential figures of the 20th century. He was able to bridge the large gaps between music and cultural awareness, folk and rock, politics and poetry. Time Magazine called him a "master poet, caustic social critic and intrepid, guiding spirit of the counterculture generation." Someone once said of Dylan, "there are giant figures in art who are sublimely good - Mozart, Picasso, Frank Lloyd Wright, Shakespeare, Dickens. Dylan ranks alongside these artists." Granted that 'someone' was a Dylan biographer. But whatever. Early in his career he became the figurehead of social change, a position he felt uncomfortable with, before he became known as a recluse, then a born-again, then cryptic mastermind. In the early 60s, Dylan modelled himself after Woody Guthrie (of whom Dylan said, "you could listen to his songs and actually learn how to live") and became a dominant part of the folk scene with his compositions like "Blowin' in the Wind" and "A Hard Rain's a-Gonna Fall," from his Freewheelin' Bob Dylan album, and his politically acerbic album The Times They Are a-Changin'. By the mid-sixties, Dylan was moving away from his folk roots and began experimenting with sound and writing songs that were more vague and less overtly protest. His fourth album, appropriately titled Another Side of Bob Dylan, was acclaimed by some and denounced by others for Dylan "somehow losing touch with people." This reception was only a taste of what was about to come for Dylan. With the releases of Bringing It All Back Home, Highway 61 Revisited, and Blonde on Blonde, Dylan had managing to define -- and then redefine -- an entire generation. 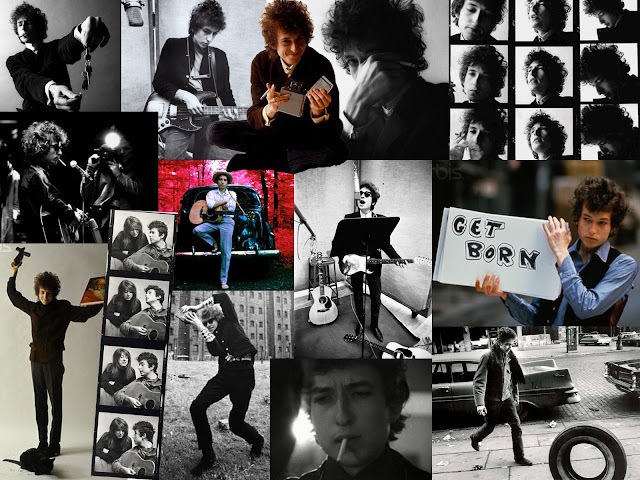 His move from acoustic to electric was considered sacrilege to his devout folkie fans, but many admired and were inspired by Dylan's ability to blend his folk roots underneath his fascination with modernism and Beats (he was hanging out with Allen Ginsberg all the time at this point...), Dadaism, methedrine, rock and roll, amphetamines, and general poetic vagueness. And despite Dylan's many claims to the contrary, his work is poetry in and of itself. The truth is that even if you don't like Bob Dylan's music, his influence is seen everywhere in music, so you inevitably are liking something about him even if you don't realize it. He made it possible for a singer to not have to have some slick routine or clean, glossy image, or even a voice that was like anyone else's. Sam Cooke said that after Dylan came out, the persona of the rock and roll star changed: "From now on, it's not going to be about how pretty the voice is. It's going to be about believing that the voice is telling the truth." Dylan was and is always entirely himself, it's just a matter of which self he is at that moment. The thing I like about Dylan -- especially during this period of his career, where Marianne Faithfull addressed him as 'God Himself' -- is that despite how popular, celebrated, worshipped and adulated he was by fans, press, groupies, folkies, poets, and rock stars, he still had people and artists that he equally admired. In his autobiography, "Chronicles: Volume One," Dylan admits to being a fan of Tony Bennett, Ice-T, Public Enemy, The Beatles (he was a particular fan of "Do You Want to Know a Secret? ", which he called "a perfect '50s sappy love song and nobody but them could do it"), and Peter, Paul, and Mary (even saying that if they had asked him to join the group, he would've changed his name to Paul). You really seemed to under-emphasize how uncomfortable Dylan felt with his status. Actually a big part of the problem was that along with his status, various groups tried to claim him as their own. Bob Dylan was not a hippy, flower child, or even "folkie" (in the sense that the Village scene people were folkies...) He was Bob Dylan. He played folk early on, and protest songs, but letting that define him was not something he was happy with. Thank You for being the member of this website. Please allow me to have the possibility to show my satisfaction with HostGator web hosting. They have professional and instant support and they also offering numerous [url=http://tutorialtime.info/hostgator-coupons/ ]HostGator coupons[/url].